Plot: On October 7, 1998, University of Wyoming student Matthew Shepard was brutally beaten, tied to a fence and left to die because he was gay. Years later, Michele Josue, a close friend of Matt's, revisits the shocking case with never-before-seen photos, rare video footage, as Matt's all-too-brief life is remembered through the vivid testimonies of those whose lives he touched, from the friends and family who knew him best to the bartender who saw him on the night of the attack. I first got to see this back in January for the first time and so I wanted to see it again, and re-view it again because now it is out on DVD. This is a must own DVD of a brilliant documentary that I highly recommended in my original review, and now once again, I continue to highly recommend it as it is on DVD..
Director Michele Josue a close friend to Matthew, has lovingly created a true testament of the heart and soul. She gives an outlet to express a peaceful, and beautiful image of a loving man, and the horrible means, and hatred that took his life. This is one case that has always haunted me. It's a case that created an emotional ordeal inside me even to this day when I hear his name. I remember hearing the news when they found him. I remember when it happened, going through the whole process of the news, the haters screaming, and the court room trial. The images of the grieving parents. The moments of Matthews crying mother. To be honest at first I had a huge lump in the back of my throat in knowing that this documentary was available for me to view. I contemplated not viewing it and not reviewing it because it's such an emotional tear-jerking reality inside me. Thankfully I made myself view this film. 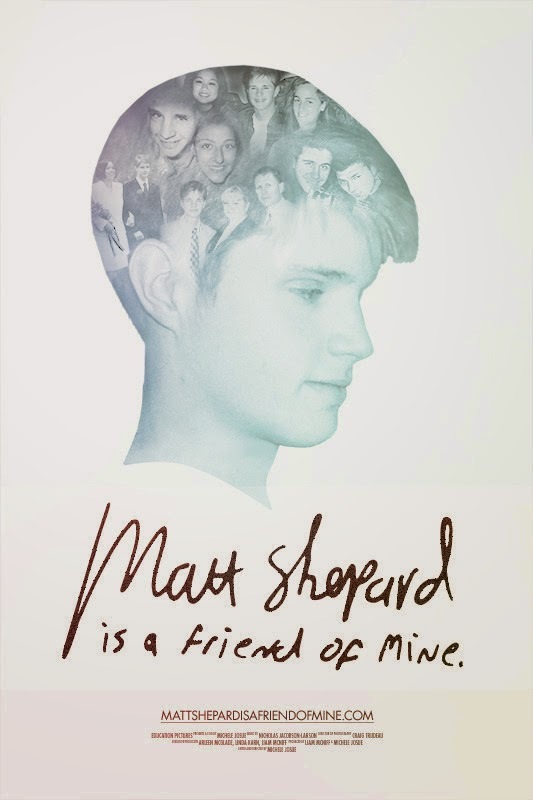 This was a film that gave an outlet to this beautiful man that was Matthew Shepard. I am glad I experienced this masterpiece documentary of a young man's life, and what his death showcased, and the reality of a true stain of hatred. Hate is such a horrible word, and a horrible reality that sadly still exist in this day and age, and is a shocking reality in the news more often every day. Everyone should have the right to be who they are, to love who they wish, as long as they are not hurting anyone else. Matthew was a peaceful individual. A beautiful boy, man, soul, that transcended to this generation because of the horrible means of his murder. So many experienced the heart ache right along with the Shepard’s. To see Judy Shepard's tears. To see a crying mother morn her broken, bruised and slaughtered son is an image I will never forget. I highly recommend this film of truth. The film shines for the love of a fallen angel, and amazing soul. It's showcased in a way that it stands out, and means something that should, and will be remembered. A true powerhouse at creating emotions, and imagery that's touches the heartstrings. Brilliant at creating a piece of film, to be remembered. I found it to be a vivid exploration of Matthews’s life, and the aftermath. No matter how many years after the ordeal, the friends, and family, and even total strangers, know that this horrible deed, happened. There are good days, and there are bad days, and there are worst days for those involved. But what makes this case so different, is we the public became a part of this young man’s life, and horrible end. I like so many others never knew Matthew in life, but it was his tragic murder that brought so many to his life, reality, and peaceful being. I, like so many others felt attached to him. I felt love for him, and his family without ever meeting him. His tragedy transcended the awfulness of the crime. It was as if the death of Matthew took a piece of so many of us across the world. He became a brother, a family member, and we all lost him, yet gained his truth. We must learn from the horror brought upon this beautiful man. We must teach that hate is the ultimate Nazi in history. An important, relevant, touching experience. A documentary that's personal. That's passionate. That cares. That expresses the love of Matthew, and the horror that was done upon him. Hate is such a powerful word, such a powerful idea, such a descriptive term. It's a word that should have no meaning, or bearing in this culture, yet it controls, yet it punishes, and yet it takes away. We are supposed to be, a civilized people. Hate is not part of being civilized. Hate must stop. The hatred, the bitterness, the evil took Matthew Shepard. He was taken by that hatred, that evil that so many innocent others have been taken by. To me this is a must see. A moving experience that shines on the craftsmanship of creating brilliant, memorable pieces of documentary cinema. Now you can own this on DVD. Michele Josue made an excellent documentary that lingers with you, and lets you experience never before seen photos, rare video footage, and emotions, that this case was about. A perfect documentary that should be seen at all cost. A wonderful tribute to Matthew's memory. Michele Josue gave a gift to Matthews family, friends, and even to strangers like myself in creating this perfect film.